Which are your favourite items by Aarikka? Poll questions for Your favourite items. Send us your feedback now. Aarikka wooden Christmas decorations, supplied by Arctic Fashion, can be found on our new dedicated website - check it out now! Here you will find great gift ideas and present inspiration and ladies style tips. 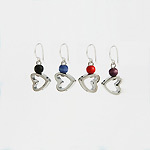 Scroll down for more information about our fantastic range of wooden jewellery and green gifts. 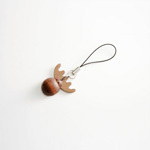 Spruce up your look this festive season with a new wooden necklace from Arctic Fashion. This beautifully designed wooden tealight candle holder is this month's buyer's choice. Towels keep falling on the floor? Towel clips are a fun and practical solution - now there's even more choice. Already a fan of towel clips? Take a look at our Scandinavian designs. Revitalise your wardrobe with our top tips for accessorizing. Looking for a wedding present? Check out Arctic Fashion's guide to choosing a unique wedding present with fabulous eco-friendly gift ideas from the Aarikka range. You owe it to yourself to make wooden earrings part of your jewellery collection - in this article we explain why. are the hallmark of Aarikka design. Bright wood earrings, colourful wooden necklaces, durable wood bracelets and unique wooden pins and brooches, all made using sustainable wood, for delivery across the UK. Unusual wooden necklaces will brighten your outfit - and your mood. The Yyteri wooden bead necklace is just one piece of fantastic wooden jewellery available from Arctic Fashion, for delivery across the UK. 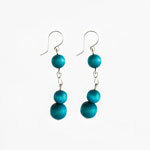 Aarikka wood earrings are beautifully crafted using sustainable wood, light and durable. 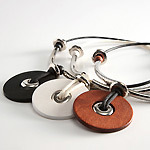 Dainty and chunky, we have wood bracelets for different tastes. 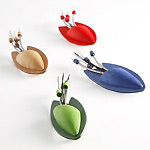 If you are looking for a bright coloured, vibrant pin or brooch then you are sure to like our wooden pin and brooch range. 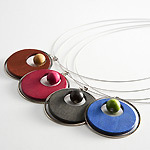 Perfect for livening up a dark jacket or as a gift for stylish mums, grannies and cat owners. 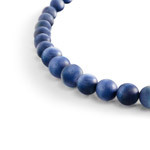 Whether you're looking for eco-friendly wooden jewellery for her, unique green Mothers day gifts, a housewarming or wedding present, gifts for under 10 pounds, or simply a token just to show you care, Arctic Fashion has a suitable gift. Looking for birthday presents for her, gifts for female friends or relatives, or anniversary presents for wife or girlfriend? 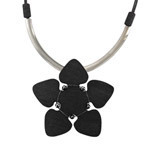 We have a variety of elegant wooden necklaces, jewellery and other special green gifts for her. 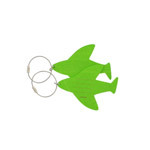 We sell several small green gifts for special occasions - funky bag charms as a gift for her, fun wooden keyrings and bookmarks, Finnish shot glasses and wooden towel clips. Trying to find unusual gifts for less than £15? 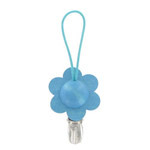 We have a selection of great value presents, including eco-friendly wooden necklaces and earrings, wood towel clips and mobile phone charms, to tempt you. 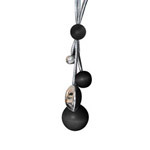 The wooden Ferro pendant is a unique mens necklace. 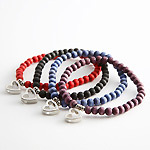 You can find this and other eco gifts for him at Arctic Fashion. 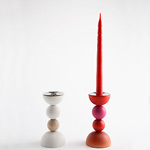 The environmentally-friendly wooden Helmi candlestick makes a special wedding present for newlyweds or a unique housewarming gift for new homeowners.